Dual Chillers before aeroacoustic remediation, complete with recirculation problems. 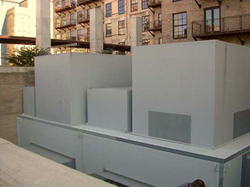 ASI Aeroacoustics has been providing acoustic and aerodynamic (aeroacoustic) products, systems and services since 1972. 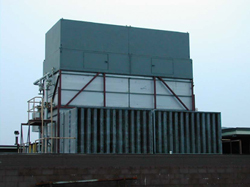 The ASI Aeroacoustic Chiller/Cooling Tower noise abatement systems require no supplemental air movers, they are 100% passive. In most installations, chiller/cooler tower performance is enhanced due to improved air flow quality and reduced solar heat gain. 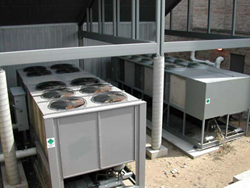 Chillers/cooling towers may now be located where they are desired and not relegated to remote locations in order to minimize noise. 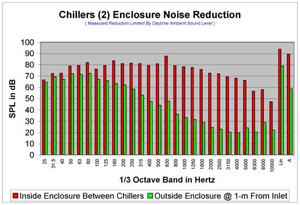 Sound attenuation may be tailored to individual site requirements - no wasted money! 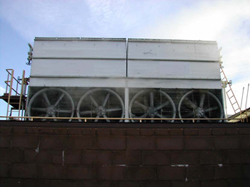 Tired of "Band-Aid" fixes to chiller and/or cooling tower equipment that creates high maintenance, air recirculation, higher ambient temperatures, increased power consumption, reduced cooling efficiency, frequent repairs and yields questionable sound attenuation? Let ASI Aeroacoustics provide a tight-fitting aeroacoustic system (patents pending) that is GUARANTEED aerodynamically and acoustically correct for your site-specific installation. Say goodbye to ALL the old "Band-Aid" fixes.